Stylish and compact, the Technomax Gold Wall Safe is an ideal way to secure small, valuable items in the home or office. Designed to be concreted into blockwork, Gold Wall Safes are easily concealed for extra security. They are designed to match the size of existing bricks, making installation easy. All models are fitted with an EN 1300 approved key lock and have been tested to the EN 14450 S2 anti-burglar standard. 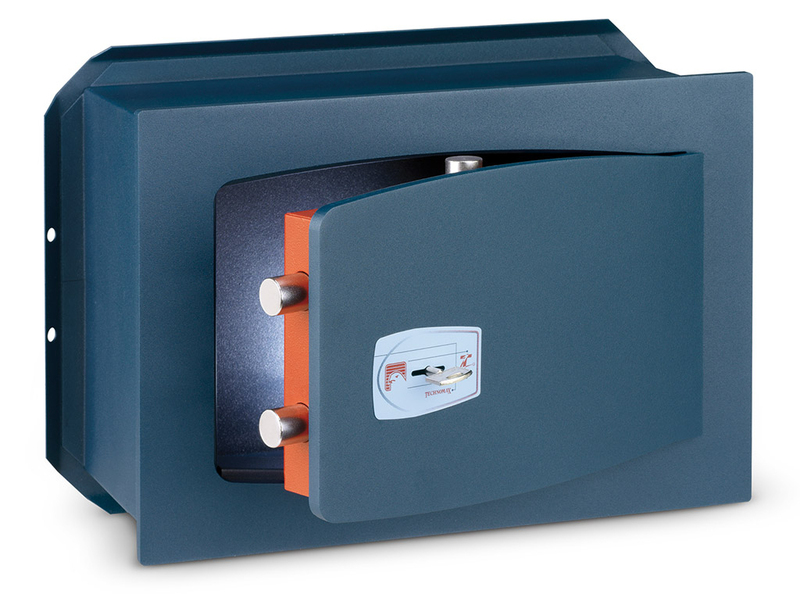 Designed to resist brute force attacks as well as tools like hammers and drills, these safes are ideal for storing up to €5,000 in cash overnight. A manganese plate provides additional protection for the locking mechanism. Technomax safes feature a unique laser cut door which is gently curved around the edges to give the safe a unique style. The green outer powder coat finish contrasts with the red metal of the interior. A removable shelf is provided with all models, so contents can be easily organized.